Products & Technology at ThermalShell Inc.
ThermalShell Concrete and Steel Panels are four times more insulated and lighter than any other pre-cast wall panel. We can cast almost any pattern on the exterior concrete surface of our panel. The interior surface is a high rib steel sheet which provides pre-formed studs, easier maintenance, and a brighter interior. 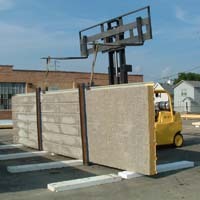 Each panel consists of our superior concrete mixture and is filled with at least 4" of polyurethane insulation. Insulated Steel/Steel panels are employed in the ThermalShell roof system. 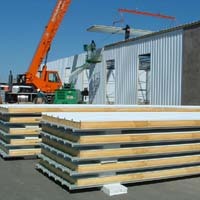 Each panel consists of two high rib steel sheets with at least 3.5" of polyurethane insulation. The ThermalShell roof system is more rigid and is simpler to install than competing roof systems. Once installed, the roof has no exterior mechanical penetrations and is protected against leaks by our unique Triple Seal System™. ThermalShell steel sandwich panels can also be used in wall applications when the building code permits and the added strength of concrete is unnecessary. ThermalShell Technologies uses a proprietary concrete formulation based on Calcium Aluminate cement. Our special mixture and chemical additives produce concrete with a much faster setting time, higher early strength, and stable lifetime strength. The resulting concrete is superior to ordinary Portland cement in many ways, and its light color makes it more versatile for pigmenting or staining. ThermalShell holds exclusive proprietary global rights to this special concrete formulation. The key to energy efficiency is proper insulation, so ThermalShell exclusively uses Dow Chemical Co. UL 94HF-1 approved fire-rated two component polyurethane foam to insulate every panel. Unlike other insulation materials, polyurethane possesses superior shearing strength, resists moisture absorption, and will not deteriorate or settle over time. ThermalShell panels provide superior strength by using the natural advantages of each building material. In the typical installation the concrete exterior provides high compressive strength under heavy loads while the steel interior is simultaneously being put into tension where its strength is the highest. In addition, the panel design transfers fewer stresses to the structural steel which increases the longevity of all the panel connections.